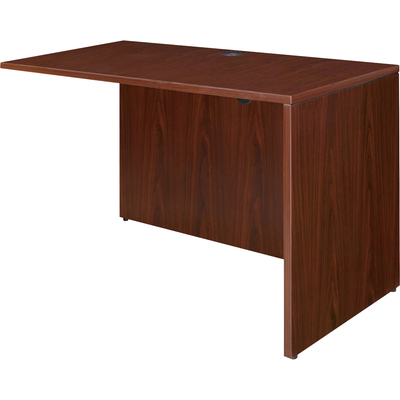 Rectangular Return Shell Is Part Of Lorell Essentials Series Laminate Furniture With High-Quality Laminate Construction And Metal-To-Metal, Cam-Lock Connections. Mahogany Laminate Top Is 1" Thick For Durability. Use The Grommet Hole In The Top For Easy Cord Routing. Design Also Includes A Full Modesty Panel For Privacy, 3mm Pvc Edges And Adjustable Feet..
Rectangular Return Shell Is Part Of Lorell Essentials Series Laminate Furniture With High-Quality Laminate Construction And Metal-To-Metal, Cam-Lock Connections. Mahogany Laminate Top Is 1" Thick For Durability. Use The Grommet Hole In The Top For Easy Cord Routing. Design Also Includes A Full Modesty Panel For Privacy, 3mm Pvc Edges And Adjustable Feet.